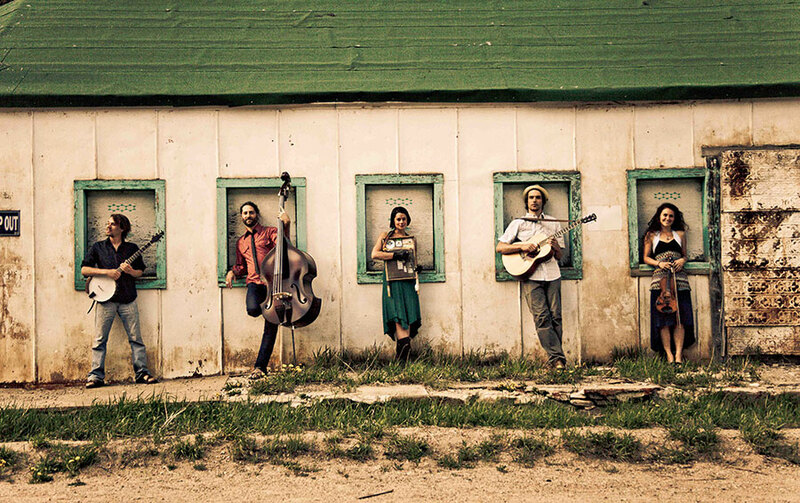 Described as “transcendental folk,” Elephant Revival’s rustic style centers around bluegrass instrumentation while dabbling in elements of reggae, Celtic fiddle tunes, jazz standards, even an occasional hip-hop beat. The tangled tale of how the five multi-instrumentalists came together and ultimately settled in Colorado is as eclectic as their unique repertoire. The first linkage came in 2003, when bassist Dango Rose encountered Bridget Law, who had set out fiddling at the Waldorf School in her native Denver. After that came various friendships and musical connections forged in Connecticut, Kentucky and Colorado; a significant gathering point was the Walnut Valley Festival in Winfield, Kansas. For the next few years, the affiliation of musicians—Rose, Law, Bonnie Paine on washboard, stompbox and other percussion; Daniel Rodriguez on guitar and banjo; and Sage Cook on the electric banjo, guitar and mandolin—would play with one another whenever and wherever they could. “We kept crossing paths for the next few years, different festivals all around the country,” Rose said. “We knew we had a very strong connection musically; we heard something in each other. The players then relocated back to the thriving music scene of Nederland, Colorado in the fall of 2006. “When I was young, I had lived in Nederland for about three years, playing with an old-time string band called High on the Hog,” Rose explained. “We were part of the ‘picks’ that would go on at the Pioneer Inn and the Acoustic Coffeehouse, and I got to know the guys in Yonder Mountain String Band and Vince Herman of Leftover Salmon pretty well. When the run ended, the five musicians left standing played their first official gig together at the Gold Hill Inn, performing as Elephant Revival Concept. After solidifying the group, the Colorado ensemble dropped “Concept” from the moniker. They started playing gigs around Colorado, released a few records and made strides in the national acoustic music circuit. Weaving a cohesive tapestry from disparate influences, Elephant Revival’s music mesmerizes with the evocation of a traditional folk group and the communal vim of a jam band. Every member contributes original songs, with many reflecting a proud social consciousness and deep commitment to certain ideals, such as responsible stewardship of the planet and its inhabitants. Elephant Revival’s third album, 2013’s These Changing Skies, peaked at #8 on Billboard’s Top Heatseekers chart. In 2015, the band released a live album and DVD recorded during a two-night run at the Boulder Theater. Elephant Revival announced an indefinite hiatus in 2018.